Delivering the President's address at the Council of Bishops today in Lake Junaluska, N.C., Bishop Rosemarie Wenner said that discipleship in the 21st century, as in Biblical times, means that we sometimes travel difficult or uncharted roads. "Disciples are like scouts. They find a path where the road ends. And they help each other in order to move in the right direction and to stay together, although the individuals journey at a different pace," stated Bishop Wenner, who leads the Germany Episcopal Area. "Conflicts are an ongoing reality in the church,” she said. “Because the church of Jesus Christ is composed of many diverse people, unity is not a static agreement, but a constant move, where we engage with one another in discerning God’s will for all." 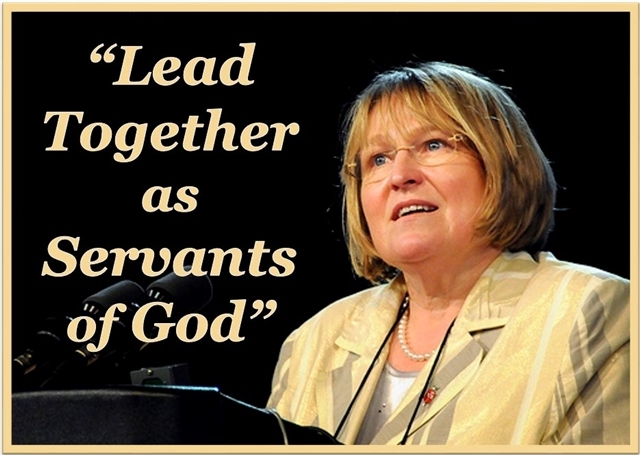 She called for the Council, the top spiritual leaders of The United Methodist Church, to learn to relate to one another with “Laganda” – team spirit – and depend upon one another in order to be faithful to God’s mission. "The world is too complex for one single individual or one single group in the church to respond to the challenges. We need each other to explore a path that leads to vital congregations engaged in mission." She said that the Executive Committee of the Council of Bishops is meeting regularly with the presidents and general secretaries of the boards and agencies in a "collaboration team" to align the work of the various constituencies. During the six-day Council of Bishops meeting, the bishops will be discussing questions such as: What is the core of our identity? How can we work together to increase the number of vital congregations? How can we best lead the church toward the next General Conference? How do we engage the church throughout the quadrennium in Holy Conferencing on divisive questions? In her address, Bishop Wenner underscored the need to lead together even if all are not of one mind. "It is the Holy Spirit that keeps us together! This is a stronger bond than any ‘team spirit’ that we might be able to instill," she preached. "By God’s grace – in Jesus Christ through the Holy Spirit – we will be able to make progress in acting as in ways that better reflect who we are as Christians. We Methodists know – this is God’s work and this is our effort!"